The London Borough of Waltham Forest is a London borough in east London. 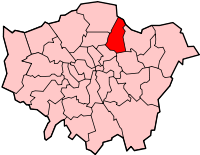 Waltham Forest has urban districts in the south with inner-city characteristics, and richer housing development in the north. The north has reservoirs, open spaces, small sections of Epping Forest, parks, and playing fields, which together cover a fifth (20%) of the borough. This page was last changed on 13 February 2016, at 15:07.